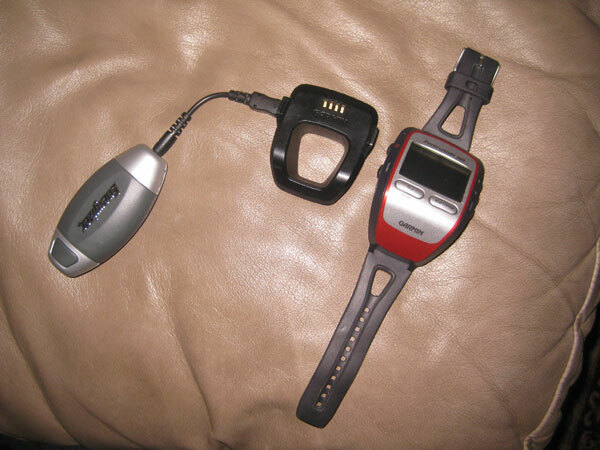 Below are photos of the Duracell "My Pocket Charger" connected to a Garmin Forerunner 305. It comes with two AA alkaline batteries and two small cables. You'll be using the "mini" cable which plugs into the 305 cradle. The package says you can get up to 1 hour of "talk time." The data sheet inside the package says you can get up to 36 hours of music on the latest iPod® nano. I wouldn't think the 305 would use any more power than the iPod® nano. It's designed for Blackberrys or Motorola phones and other devices; it works perfectly with the 305. It has a blue light indicating power on and comes with a wrist strap. I attached my 305 and Duracell combo to my Camelbak hydration vest. Another option is to attach it to a belt pouch, but certainly there are other ways to make this system work for you. I was able to get 14 hours out of the 305 with its internal batteries charged from the wall outlet. I don't seem to get as much time when charging the 305 via my laptop's USB port. After 14 hours, the 305 turned off and I connected the Duracell My Pocket Charger to the 305 and got an additional 17+ hours with two new Energizer Ultimate Lithium batteries installed. It's important to note that the Duracell "Copper Top" alkaline batteries that came with the unit only lasted a couple of hours. With the lithium batteries, the blue light went out after several hours, but the unit continued to work just fine for 17 more hours. 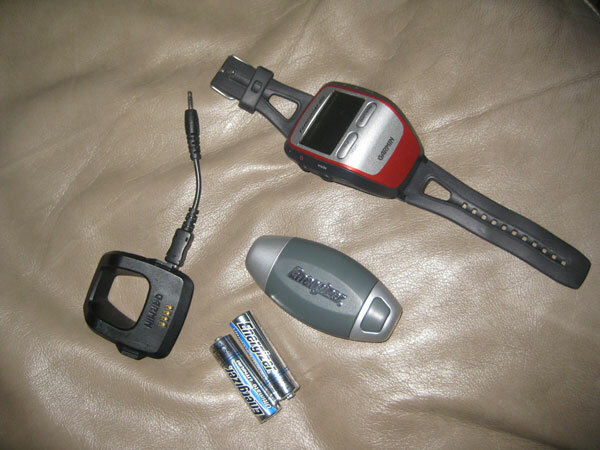 To get through a 30-hour 100-mile event, you would only have to use two Energizer Ultimate Lithium batteries. I suggest connecting the Duracell unit after 12 to 13 hours to avoid tracking and data loss. My test included a five-hour training run on Saturday morning starting at 3:30 AM. The unit continued in the "Power ON" condition thru my six-mile tempo run on Sunday afternoon, finally shutting down Sunday evening around 6:00 PM. Total "ON" time was 38.5 hours. 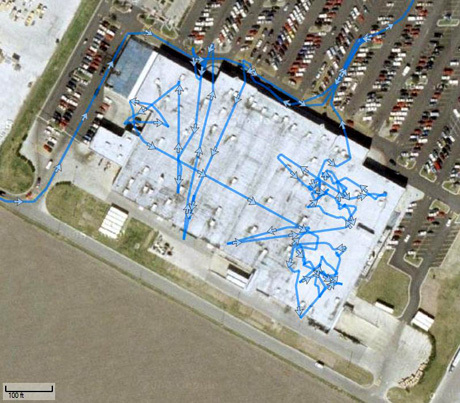 Total tracking time was 30.5 hours. Important - YMMV! Combo attached to Camelbak strap. 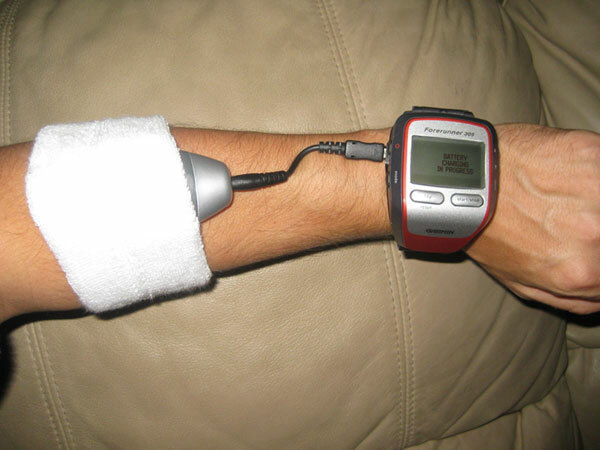 Jakob let his Garmin run all day long to drain the battery, as it would in a race. Then he took it on a run. On the run, he connected his battery pak and ran with it while his Garmin was charging. During the 40 minute run the battery pak recharged the Garmin battery from almost empty to almost full with only one bar to go. Jakob says it worked like a charm. He could see the battery pak blinking while it was charging assuring him that it was in fact connected and charging. Once the battery is full it stops blinking. BTW, he bought his recharge unit at Fry's Electronics for $20. Jakob was running Chimera 100 Mile on December 12, 2009 when the race was canceled due to weather. This was only a few miles into the race so unfortunately he didn't have the opportunity to test his recharging system. He'll have to enter another 100 miler to completely test his system.